John McTiernan’s Nomads is stylishly made and not without some interest; however, for whatever reason, he decided to needlessly complicate his narrative to an irritating degree. It’s also very muddled and provides us “monsters” that, I guess, were meant to be terrifying but are only shrug-worthy. Even after the end credits roll, you’ll still be scratching your head wondering what all of it was supposed to be about. Now, if the movie simply followed Down as she researches and tries to solve the mystery of Brosnan’s death, or if it told Brosnan’s story and jettisoned the opening scenes, Nomads might have worked, sort of. Instead, the screenplay has Brosnan’s energy…or spirit….or memories somehow transferred to Down so that she has periods where she is overcome by flashbacks of the days leading up to the present. This is as unconvincing and awkward as it sounds. It means that for the majority of Nomads has Down going crazy with hysteria as she “relives” the movie. Down, never an actress to ever underplay anything, shrieks and lurches through it all. Bronson isn’t much better, the hideous French accent is so unconvincing you wonder why a French actor wasn’t hired or why McTiernan didn’t simply make the character British. So, what is this all about anyway? As we come to find out later, Innuat are evil beings that travel the globe in groups and….well….their purpose remains unclear. Brosnan appears to always be followed by these beings wherever on Earth he seems to be, because unlike everyone else, he knows what they are. In this incarnation, the Innuat take the form of a gang of California thugs who…shudder…wear black leather and other punk rock fashions while roaming the streets endlessly in a black van. Considering two of these thugs are played by low-budget film queen Mary Woronov and pop stars Adam Ant and Josie Cotton, their scare factor is pretty low. Eventually, Down comes into contact with Brosnan’s wife, Anna Maria Monticelli, and the bad guys realize that Down knows who they are so they break into Brosnan’s house and spray the walls with graffiti while the women cower in the attic. 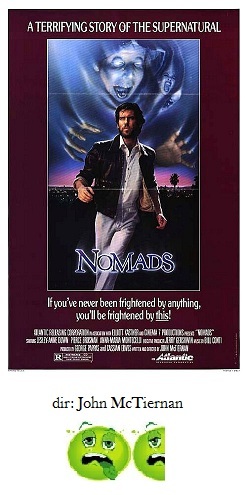 Nomads ends with Down and Monticelli fleeing in a car while being pursued by a man on a motorcycle who turns out to have the same face as Brosnan. I guess this is significant, but I have no clue as to why or how. The best part of Nomads is its visual style, which goes a long way into making it watchable despite its confusion. Director McTiernan followed Nomads with the mega-hits Predator and Die Hard before committing career suicide with The 13th Warrior and the remake of Rollerball. The directing talent was there no matter how many rewrites the script needed..